04:12 — Star Wars: Han Solo’s directory shake-up! 06:21 — Dracula: Moffat and Gatiss want a sucker. 08:30 — STD: Another airdate announced. 11:18 — Stephen Furst: DEAD! 13:19 — Rick and Morty: Cluedo. 14:18 — Brian Cant: DEAD! 17:13 — Doctor Who: The War Master. 19:21 – Game: Name that Door. 34:27 – Doctor Who: The Eaters of Light. 50:28 – Game: Things in Five Words. 57:41 – Emails and listener feedback. 67:14 – Farewell for this podcast! 67:49 — End theme, disclaimer, copyright, etc. Wikipedia: Untitles Han Solo film. Big Finish: The War Master. 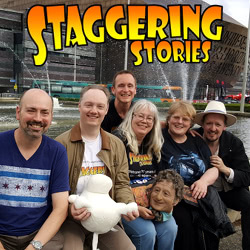 This entry was posted on Sunday, July 2nd, 2017 at 10:00 and is filed under Doctor Who, podcast, review, Sci-Fi, staggering stories, Staggering Stories Podcast, Staggering Stories Regular Podcast, tv. You can follow any responses to this entry through the RSS 2.0 feed. You can leave a response, or trackback from your own site.